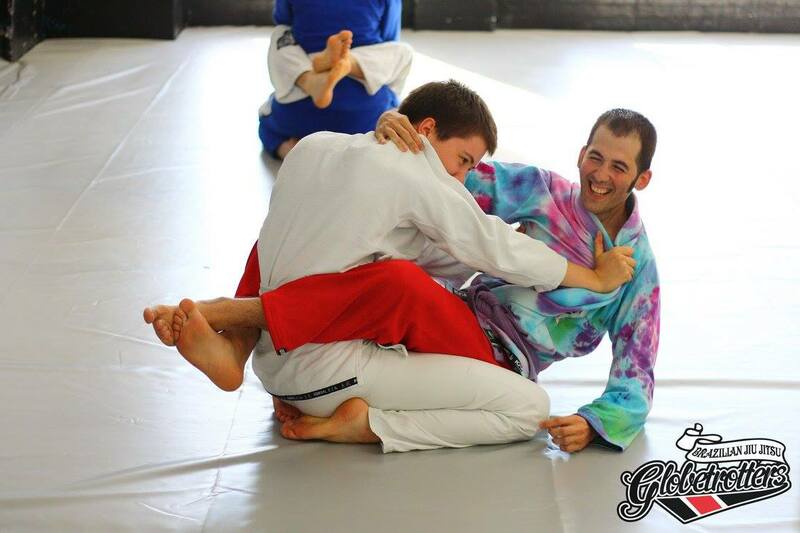 The BJJ Globetrotter Camps are amazing, which is why Can regularly attends several every year. Unfortunately, not everybody has the time to take a whole week off work to enjoy a spot of pyjama wrestling. 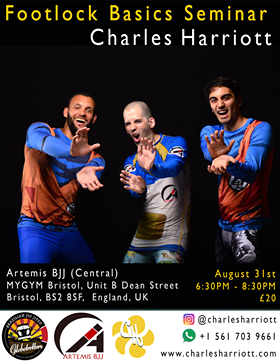 Therefore, Artemis BJJ hosted a mini BJJ training camp right here in Bristol to bring a taste of that experience closer to home. Our first attempt, mostly in an effort to test to see if this BJJ training camp idea can work, was held over the 25th-26th August at our Clifton location, The Exercise Club on 213 Whiteladies Road, along with a few sessions at MYGYM (directions are over on our Locations page). 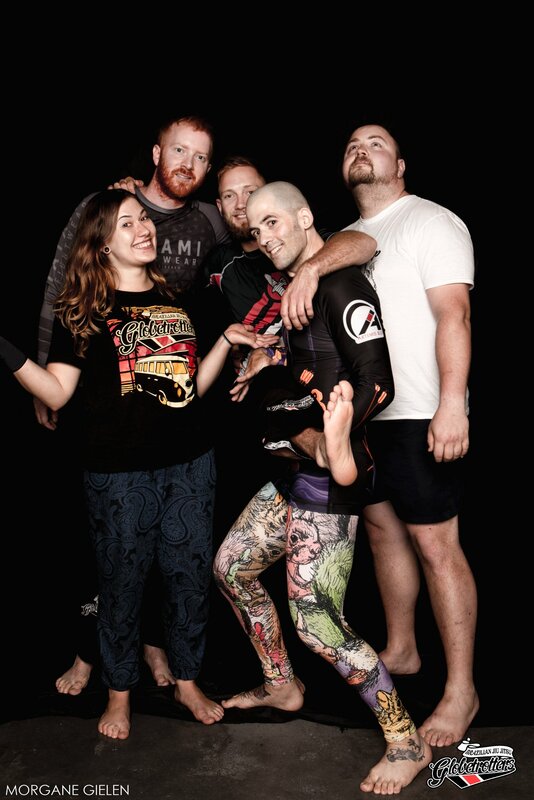 Everybody is always welcome at Artemis BJJ, wherever you train. We had an excellent turnout, with around 30 grapplers sharing the mats over the Bank Holiday weekend (you can check out Meerkatsu’s write up over on his website). Putting open mat inbetween each class worked well, though perhaps a longer break for lunch would be worth trying next time. There is scope to expand on the Sunday, if we hold it in the same venue, so that could mean more classes and more open mat. There is also the option of upgrading in terms of space, to the larger venue at MYGYM, though that would mean a higher ticket price. We’ll be considering the options over the next few months. In August 2018, three of us from Artemis BJJ headed to Heidelberg in Germany for another BJJ Globetrotters Camp. In Can’s case it was his seventh camp, but the two students hadn’t been before. There was lots of excellent training, Dungeons & Dragons and a random impromptu bodybuilding competition (won by the very awesome Heather Raftery). Most importantly for the club, Can has loads of techniques to bring back and teach. We’ll be taking a look at Lilo Asensi’s intriguing instep to neck armbar series, Jeff Knight’s pointers on half guard, Heather Raftery’s details on the crucifix and quarter guard, Daniel Bertina’s passing and some introductory leglock material from Charles Harriott. In fact, we will be lucky enough to have Charles himself teach that material, as he will be in the UK later this month. There will therefore be a two hour introductory footlocks seminar on the 31st August, from 18:30-20:30, followed by open mat. As always with Artemis BJJ seminars, this will cost £20 and everybody is welcome, wherever you train. Check out the Facebook event page for more details. Also, don’t forget that Can is launching his own mini-camp in August to try and bring that BJJ Globetrotter feeling to Bristol. This first event, on the 25th and 26th August weekend, is a test to see if it’s a viable option. It will be held at 213 Whiteladies Road, our Clifton venue (full changing facilities and showers for both women and men). Tickets are £50, which is non-refundable as the proceeds will be used to pay for the venue and the instructors. However, you can of course sell that ticket on if it turns out you can no longer make the event. Please contact info@artemisbjj.com if you would like to buy a ticket: there is a maximum of 30, so you’ll need to be quick! In July 2018, more grapplers from Artemis BJJ made another return visit to Leuven. Almost of us had been before, while in my case it was my fourth Leuven Camp. There was lots of excellent training, top notch techniques and some funky dance moves at the awesomely 80s themed open mat (one of several musical themes Christian picked, always a nifty addition to his camps). Most importantly for the club, Can had loads of techniques to bring back and teach. We’ll be taking a look at x guard from Henk Heneweer, along with some back attack details from Hillary Van Ornum, more passing from Fran Vanderstukken and a handy detail on the crucifix from Jochem Branderhorst. There is plenty more to come in the next few months, which will be further enhanced by yet another BJJ Globetrotter Camp, with a return visit to Heidelberg. Can is one of several Artemis BJJ representative at that one as well, as a few of our students are booked to head to Germany too. Be sure to book your ticket as soon as possible for Leuven next year: they sold out a few weeks after the box office opened last year, so you will need to be quick. Don’t miss out! Can is launching his own mini-camp in August to try and bring that BJJ Globetrotter feeling to Bristol. This first event, on the 25th and 26th August weekend, is a test to see if it’s a viable option. It will be held at 213 Whiteladies Road, our Clifton venue (full changing facilities and showers for both women and men). 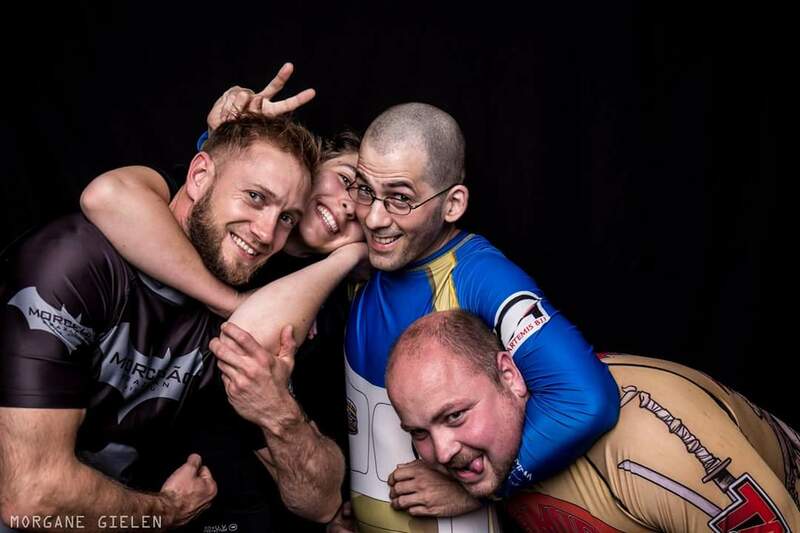 In July 2017, the intrepid grapplers from Artemis BJJ made a return visit to Leuven. All of us had been before, while in my case it was my third Leuven Camp. There was lots of excellent training, top notch techniques and some funky dance moves at the random mass singalong that happened in the centre of town on the last day. Most importantly for the club, Can had loads of techniques to bring back and teach. So far, we’ve had a look at half guard techniques from Fran Vanderstukken and Kenny Polmans, along with some nifty triangle details from Joey Carta. There is plenty more to come in the next few months, which will be further enhanced by yet another BJJ Globetrotter Camp, this time in Heidelberg. Can is the only Artemis BJJ representative at that one, as sadly Chris had to pull out due to injury. Not to worry, as the techniques will be coming back to Bristol. There are also more upcoming camps this year which will feature Artemis BJJ students. 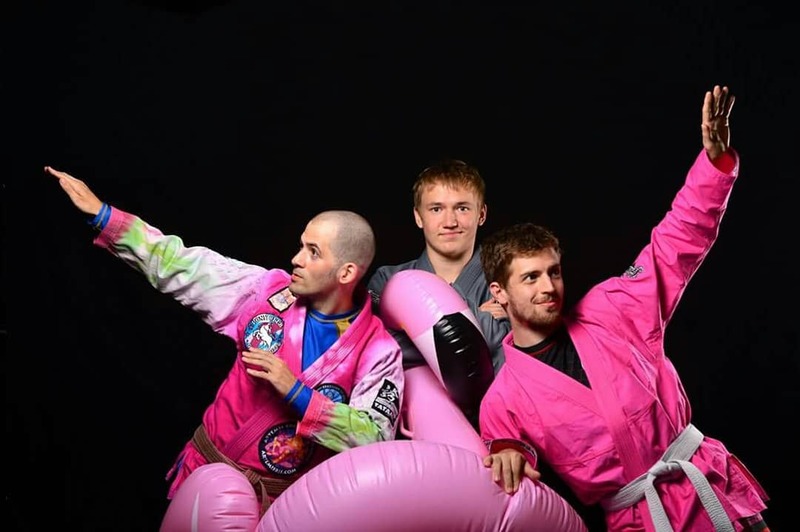 A large group (not including Can, who will be teaching class as usual) is planning to go to Zen Camp in Poland, another brand new offering from BJJ Globetrotters. Hooray for even more techniques to bring home! On the 18th July, Can headed on the train to the inaugural UK BJJ Globetrotters Camp, held at Phoenix MMA in Bournemouth, to take part on the Monday. If like Can you don’t drive,then it is possible to get there from Bristol in about three hours: he took his bike on the train, so cycled straight to the gym. Monday featured five classes, including some old friends from Leuven (David teaching de la Riva passes, while Christian discussed posture inside closed guard) and even older friends from early in Can’s trainined. Lorenzo was at the Roger Gracie Academy when Can started in 2006, while Chiu was Can’s instructor for part of 2010. As ever, Can will be writing up all the classes on slideyfoot.com. 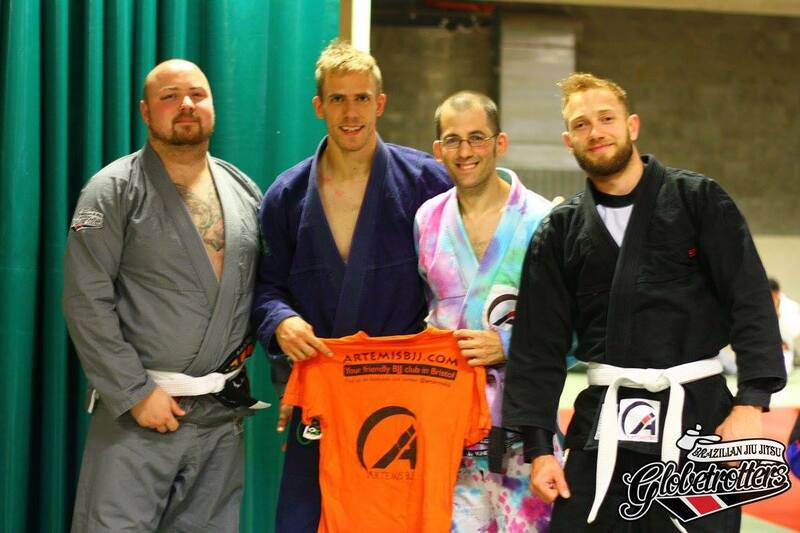 Artemis BJJ student Chris J is also at the camp, staying for the full week: the camp continues through to Saturday. It sells out quickly, so if you’re interested, be sure to sign up soon once the 2017 edition is announced. 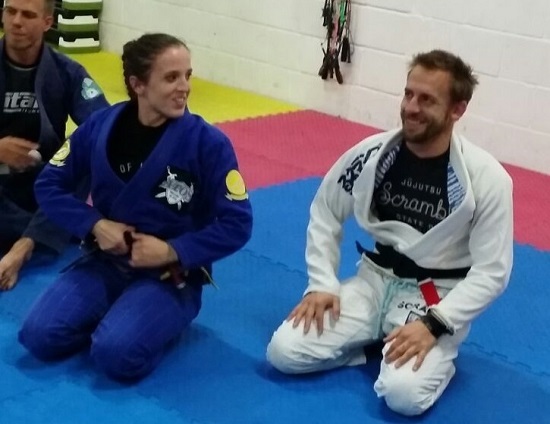 Most exciting of all for Artemis BJJ students, Ana Yagües flew over from Germany to teach a class on de la Riva, using a deep hook for a powerful sweep. Can has been teaching that this week back in Bristol: if you would like to learn more awesome techniques from the woman herself, Ana will be in Bristol this Sunday for a seminar at Artemis BJJ. The seminar will be at MYGYM from 12:00-15:00 on Sunday 24th July, only £20: everybody welcome! Register your interest on the Facebook event page, here. We’re hoping to bring an even bigger team out to Belgium next year, so please let Can know if you’re interested in coming to future BJJ Globetrotter camps. Can will be bringing many of the techniques he learned back to Bristol, as there will be a heavy BJJ Globetrotters influence on classes for the next few months. Of course, you don’t have to wait until next June to go on a BJJ Globetrotters camp: they run throughout the year. There is one in a few weeks in Bournemouth (sold out, but keep it in mind for next year), followed by Copenhagen (possibly still has places: Kirsty will be going), then various other camps around the world. There are even luxury camps in the Caribbean, if your budget stretches that far. Thanks again to all the awesome instructors, who taught us so much excellent stuff over that week. Thanks also to Vara, who was the woman in charge: that picture is one of the many she took. Without Vara, there would be no BJJ Globetrotter camp. Can will also have a full write-up on slideyfoot.com at some point: individual write-ups for each of the classes he attended will be here.